Nancy - we have been trying to figure out our driveway for more than 10 years -- can you help? The street in front of our house is busy and right now we have a narrow long driveway on the side of our house down to garage behind the house. We are on a corner lot and so we'd like to change the entrance so it is a U shaped driveway -- so people can feel like they can drive in and use driveway, and so we can close off the driveway onto the busier main road. Now people either park on the street or drive in the back entrance by driveway (but then have to walk around to the front door - which is closer to the main street). The other problem is that the drop or incline from the lower entrance to the "upper" entrance is about 4-5 feet (which we will try to reduce by lowering the top portion -- ie, the entrance from street). So question for you is i) whether the attached U driveway will be workable and usable and ii) whether the incline between the entrances is too much. I know you don't have a ton of info but any guidance or thoughts would be appreciated. 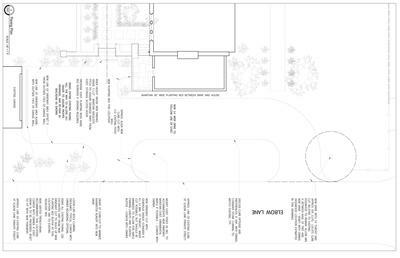 I have taken a look at the drawing and the U-shaped driveway looks like it fits. The print is too blurry to read, so can't read the notes. Hopefully, I can give you some useful information. If possible, make the width of the driveway by the house 18-20' wide, so two cars can pass each other. Drainage is also an important consideration, so take this into account when doing any lowering of the driveway especially around the house. Water needs to always be directed away from the house. Because of the slope between the two areas, does the front "U" have to be attached to the existing side entrance? You described the "U" as attached. Would this be better done with a walk? I often separate a front driveway from the more utilitarian one. This may not allow you to close off the existing entrance however, but it would allow you to have a nice front entrance. The 4-5 foot difference in elevation sounds like a lot of slope for a driveway, if the distance of the driveway is the width of the house. Please feel free to get back to me with any comments.